Bordeaux contains copper sulfate and spray lime mixed just before application with water. 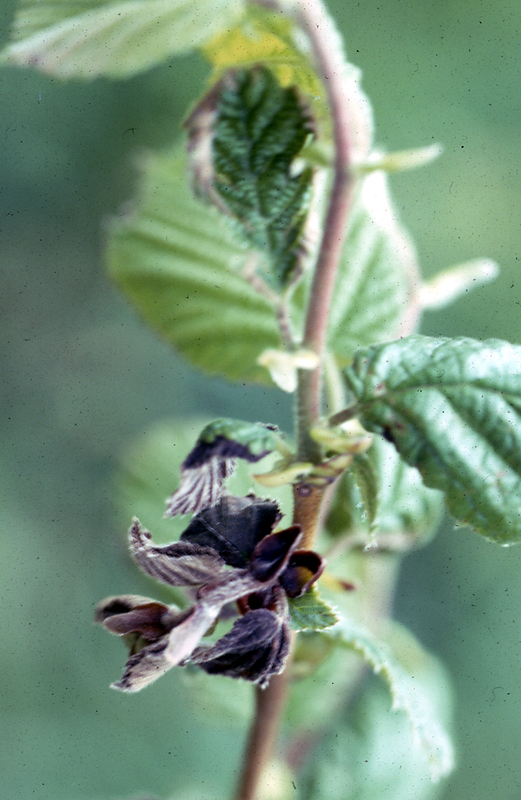 At high rates, Bordeaux mix can injure young plant tissue as has happened to this hazelnut shoot. Bordeaux mixture is an outstanding fungicide and bactericide for controlling some diseases of tree fruits, small fruits, and ornamentals. Bordeaux mixture’s ability to weather fall, winter, and spring rains and adhere to plants is a valuable characteristic. Probably the most effective bordeaux solution is made the “old-fashioned” way by preparing “stock” solutions of lime and copper sulfate that are later mixed by pouring into water in the spray tank. Many growers, however, do not have the proper containers or the time required to make bordeaux this way. Tank-mix bordeaux is an excellent fungicide and bactericide that requires little time and no special containers for preparation. There are many bordeaux formulas to control plant diseases. Each formula recommended is the result of research on a specific crop disease. For example, bordeaux 8-8-100 is recommended to control peach Coryneum blight, and bordeaux 12-12-100 to control dead bud of cherry. Because bordeaux colors plants blue and may discolor house paint, it is not used as often on ornamental plants as it is on agricultural plants. Applying bordeaux in hot weather can cause leaves to yellow and drop. Bordeaux formulas are stated as three hyphenated numbers: 8-8-100. The first number refers to the pounds of bluestone (copper sulfate), the second number to the pounds of spray (hydrated) lime, and the last number to the gallons of water to be used. Thus, an 8-8-100 bordeaux contains 8 lb copper sulfate, 8 lb spray lime, and 100 gal water. Prepare Small Amounts of Bordeaux Spray Using these Conversions. Ready-mix bordeaux preparations are available but usually are less effective than the tank-mix or “homemade” bordeaux. Copper sulfate Use only powdered copper sulfate (bluestone or blue vitriol), often referred to as copper sulfate “snow” because it is finely ground and dissolves relatively quickly in water, to prepare tank-mix bordeaux. Ordinary lump copper sulfate is not satisfactory. Store copper sulfate snow in a dry place. Moist snow becomes lumpy and is difficult to work through the screen into the tank. Use copper sulfate registered to make bordeaux mixture. Lime To prepare tank-mix bordeaux, use only good quality hydrated lime (calcium hydroxide). The hydrated lime should be fresh, that is, not carbonated by prolonged exposure to air. Hydrated lime is stable and usually is readily available under several trade names. Magnesium lime, a mixture of Ca(OH)2 and Mg(OH)2, may also be used. Slaked lime (calcium hydroxide, or Ca(OH)2) Slaked lime is prepared by adding water to “quick” lime, also called hot, burned, or unslaked lime, all of which are calcium oxide, or CaO. (CaO + H2O → Ca(OH)2) . Slaking produces enough heat to boil the water, so be careful about how much lime is exposed to the water at any one time to avoid splashing. Slaked lime makes an excellent suspension and may be used to prepare tank-mix bordeaux mixture, but slaking requires more time, effort, and containers than using prepared hydrated lime. Start water flowing into the spray tank. When the tank is about a third full and the mechanical agitator is on, start washing the copper sulfate snow into the tank through a screen with water from the supply hose. A wooden spoon or paddle is often helpful in working the snow through the screen. Don’t hurry the snow through the screen—give the copper sulfate time to go into solution in the tank. By the time the tank is two-thirds full, all of the snow (copper sulfate) should be in the tank. Then use the water supply hose to wash the lime through the screen into the copper sulfate solution in the tank. Again, a wooden spoon or paddle will be useful in working the lime through the screen into the tank. The lime should be as diluted as possible before it meets the copper sulfate solution in the tank. Use lots of water to wash the lime through the screen. Start the mechanical agitator in the tank before you put the copper sulfate snow in; keep the agitator going as you add the lime and until you apply the spray. A bypass agitator system is usually not adequate to tank-mix a bordeaux. Apply bordeaux the day you make it—it deteriorates on standing. If it has to be left overnight before use, add 1/8 oz of sugar for each pound of copper in the tank; for example, for 100 gal of 8-8-100 bordeaux, add 1 oz sugar to the spray mixture.